Well, from approximately 1969 until 1999, Australia was the world leader in terms of amount of diamonds being mined within the country. During these years Botswana and Russia were second and third respectively in terms of diamond production. In 1998 all of the known Australian deposits had been all but depleted, while new deposits were being discovered at a rapid pace in Botswana. Diamond mining had remained rather constant from 1994 until about 2003. Russia first started mining diamonds in its northern regions of Siberia in the late 1950’s as a way for the USSR to remain self-sufficient while competing in a new high-stakes world market. In 1970, Russia was competing as the world’s third largest producer of diamonds, far surpassing any production rate that America could keep up with. When the USSR fell, the diamond mines in Russia came under private ownership and continued to flourish. From 2003 to 2004 Russia increased its diamond production by nearly 250%; pulling away from the pack and making it the true and solid second in today’s world diamond game. Botswana still remains the top producer however. 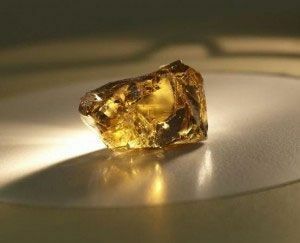 On April 21, 2011 workers of the Udachninsky Mining Company in Siberia unearthed a massive 136 Carat honey-yellow diamond. This is a very unique color for a diamond, and some speculate that it has something to do with the extreme latitude at which this diamond was found. The diamond mines in Siberia are some of the most northerly mines in the world. Several mines in Canada’s Northwest Territory rival for this position. In any case, there is no denying the impressiveness of this discovery. The diamond is said to have an irregular shape which has led to much more curiosity surrounding it. At this time, the diamond has not been appraised, but it is expected to catch a lot of attention if it ever goes to sale. This extremely rare find gives hope to all armature diamond hunters around the world. Your big one could still be out there. If you aren’t into digging in the dirt, however, The Russian Store has you covered with our line of exquisite gemstone jewelry.